This article describes the inner structure and organization of the elements which build the RadCollapsiblePanel control. RadCollapsiblePanelElement: Main element of the RadCollapsiblePanel control. 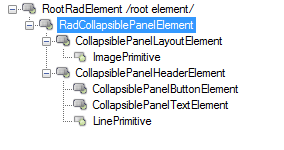 CollapsiblePanelHeaderElement: element responsible for arranging the header of the control. CollapsiblePanelButtonElement: Button element responsible for expanding and collapsing the container. CollapsiblePanelTextElement: Text element holding the header. LinePrimitve: Paints the line part of the header. CollapsiblePanelLayoutElement: Layouts the container holding the added controls.